This final special feature in our series focuses on critical approaches to mental health in comics. We begin with a comic from Liam Geary Baulch about being caught in the system, and then there are some personal reflections from Andrew Voyce about sequential art and mental health. This is followed by a challenging reflection on trauma from Nicolas Verstappen, and a practice-based article by Valentino Zullo, about how therapists might consider superhero origin stories as a useful model. 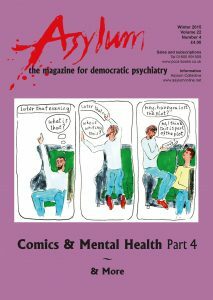 Next we have Heinz Insu Fenkl’s graphic novel, Dr. Zauze’s Xylophone, followed by Steven Fraser’s article and a comic which together challenge us to consider whether comics really are an appropriate medium for exploring mental health issues. Finally, we present a couple more pieces in colour from Liz Greenfield and Simon Warne. To read the latest issue . . . . .